Hard to semi flexible plastic, resistant to chemicals and moisture with an opaque, waxy surface. HDPE bottles offer very good chemical compatibility including most acids, bases, alcohols, aldehydes, esters and aliphatic hydrocarbons making them ideal for a wide range of applications. PET bottles are clear and tough. They provide a barrier to gas and moisture and offer limited chemical compatibility however still offer resistance to diluted acids, alcohols and bases. Polycarbonate bottles offer excellent impact resistance and window clarity. Polycarbonate bottles remain impact resistant down to -130°C and are usable to +130°C, making them suitable for use from the freezer to the autoclave. Polycarbonate bottles are chemically compatible with weak acids, alcohols and aliphatic hydrocarbons. They are not suited for exposure to bases, solvents or other aggressive lab chemicals which may cause immediate damage or product failure. Soft, flexible plastic (down to -76°C) with a waxy surface, LDPE bottles are translucent, compatible with a wide range of lab reagents and are generally a more cost effective option for the lab. These hard yet still flexible bottles are suitable for a wide range of laboratory applications. 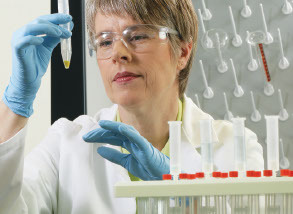 Polypropylene bottles provide very good chemical compatibility with a wide variety of lab reagents including most acids, bases, alcohols, aldehydes, esters, and aliphatic hydrocarbons. A range of bottle accessories including closures, carriers, scoops, bottle brushes.